Includes spinning chemical vat, rolling trap, giant spinning hand traps and much more. 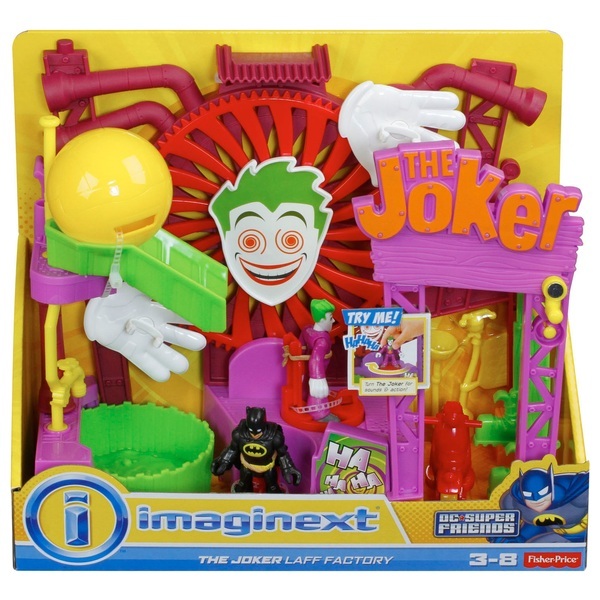 Welcome to the Fisher-Price Joker Laff Factory! The Joker wants young superheroes to get a kick out of it—especially when they rotate the yellow pipe to activate the boots that will “kick” them right back out! But that’s not all young crime fighters need to watch out for—there’s a spinning chemical vat they could fall into, a rolling trap that might drop on them, giant spinning hand traps and more! If by chance, crime fighters make it through all that, The Joker is ready to make a quick getaway on his scooter! Ha-ha!